Recent episodes of SYFY's Deadly Class have shined a spotlight into the teachers' lounge at Kings Dominion Atelier of the Deadly Arts, revealing instructors who are just as vicious and divided as the lost teenage souls they manipulate. Specifically, episode #3, "Snake Pit," witnessed Poisons Instructor Jürgen Denke (an original character played with seething intensity by Henry Rollins) resign from his position. Denke clashed with Kings Dominion's Headmaster Lin over his labeling some students rats, branding any pupil who didn't belong to a larger crime syndicate or legacy. In other words, the kids who are most likely to be impoverished, isolated, and disadvantaged are segregated (and worse) from the larger student body. 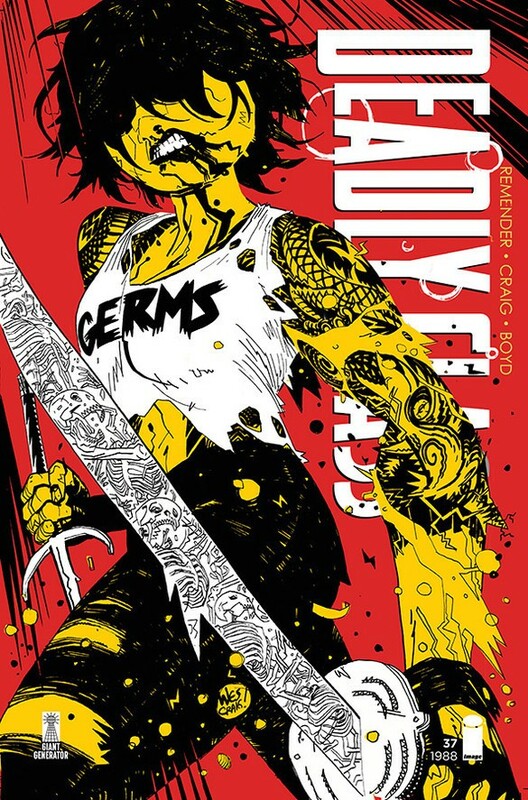 Readers familiar with Rick Remender and Wes Craig's source material comic know that fissure erupts in blood and tears in the series' fourth collection, "Die For Me," which features the most brutal final exam outside AP Chemistry. That comic series reached a landmark 36th issue earlier this month, ending with a startling revelation. After embarking on a peyote-driven vision quest, protagonist Marcus Lopez Arguello and a collection of ex-students decide to return to the blood-stained halls of Kings Dominion to clash with the faculty. Here's an introduction to the lethal instructors Remender and Craig have presented in the comic. Read the entire series to glimpse even more of the insidious teaching staff, including a spirited propaganda instructor. Spoilers below for the Deadly Class comic book series. Master Lin rules Kings Dominion Atelier of the Deadly Arts with an iron fist and Machiavellian resolve. He presents the institution as a resource to give the disenfranchised the power to rebalance world justice. 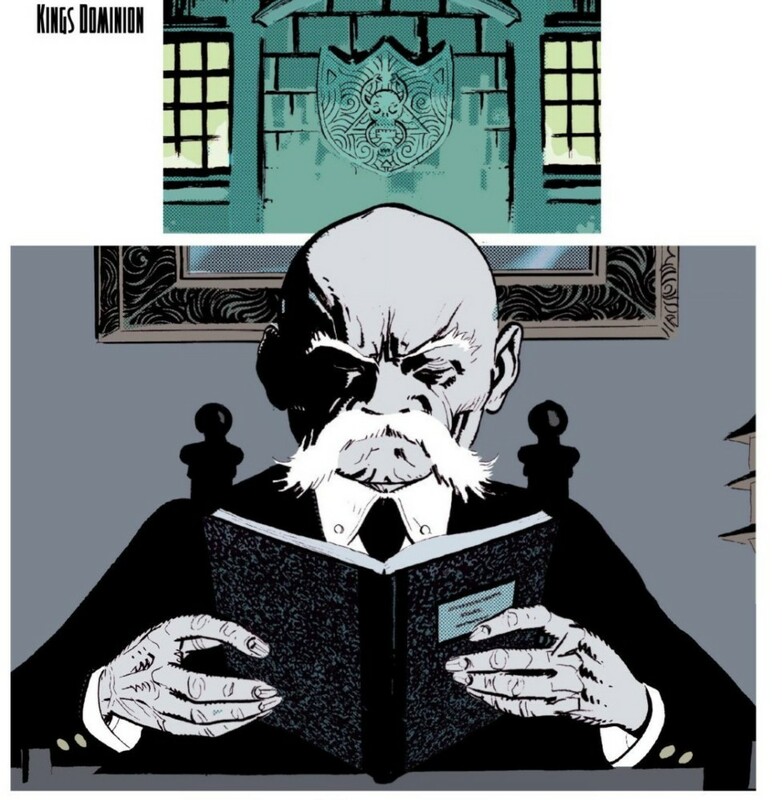 In Deadly Class #1, he lectures Marcus: "My ancestors started this school when we Chinese were treated lower than cattle. A school to train the oppressed in the deadly arts, that they might shape a world more to their interest... But I have always remembered the true reason we exist. To ensure those at the lowest levels of society also have power." That subversive benevolence fronts a far more corrupt worldview. Lin passes out boxes with rodent skeletons to select students. These gifts mark their recipients as rats, or human targets for legacy students, descended from crime organizations, to hunt. Marcus was one such rat, culminating in a chaotic and devastating final exam that marked the first year of the comic series. Outside of this bombshell twist, Lin has displayed his cruelty in other ways. He throws Marcus into "The Ditch," an isolated cell designed for solitary confinement, after Marcus and Willie kill a war veteran for Master Omenuko's first assignment. Later in the series, Lin poisons Maria and delivers her to Amante Jael—the widow of drug cartel head El Alma del Diablo—after Maria and Marcus murder Diablo and his family in retaliation for killing Maria's family as a child and recruiting her as a drug mule. Master Lin will face Marcus as the former student returns to the school after hiding out in Mexico with Maria. Master DeLucca teaches the student body how to manipulate, disarm, and subjugate its targets. 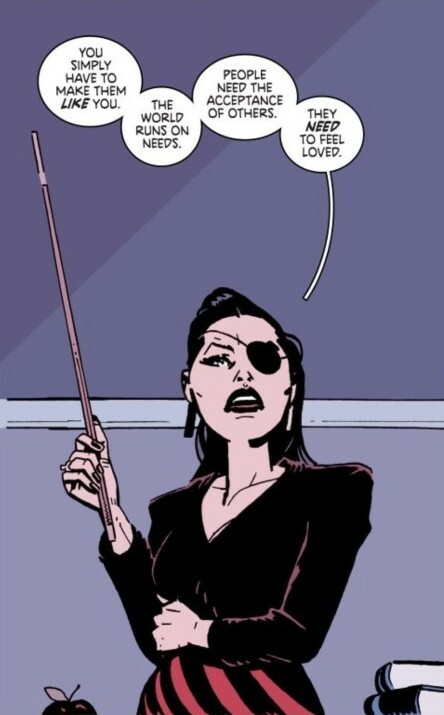 Remender and Craig introduce the attractive, eye patch-wearing educator as she lectures on the importance of mental clarity for aspiring murderers: "Assassinations are rarely ever an impulsive action. Only about twenty-five percent of the attackers were found to be delusional... While mental instability plays a role in many modern-age assassinations, the more delusional attackers are, the less likely they are to succeed." She delivers the lesson while staring down Marcus, then thought responsible for the mass murder of an orphanage. It's a cold and dispassionate treatise on bloodshed, and an appropriate manifesto within a school that systematically corrupts children and maintains a global status quo through death. DeLucca returns the next year to teach the incoming freshman class how to throw victims off their guard through sexual posturing. She asks "How do you use simple human weakness to get to your target?.. You simply have to get them to like you." After incoming freshman Quan makes a pass at the teacher, she flirts back before knocking him to the ground, quipping, "Yes, sexuality is the easiest manipulation. But more attractive to others than mere physicality is confidence. Quan's problem wasn't that he flirted with me, it was his need of my reciprocation." If any incoming pupils were confused at exactly how deadly the "Deadly Arts" suffix of Kings Dominion Atelier are, Master Sohl appears in the second issue to inform them. Sohl is the educator for a class dedicated exclusively to the skill of separating human beings from their skulls. Following Master DeLucca's theoretical musings a period earlier, Sohl lets the students know that their curriculum will dive right into the visceral anatomy of stopping people from breathing as quickly and efficiently as possible. His first class prioritizes precision, emphasizing the importance of the "cleanest kill possible," stating "If you miss this by even a millimeter, the target will suffer excruciating agony," as he relieves a dummy of its noggin. 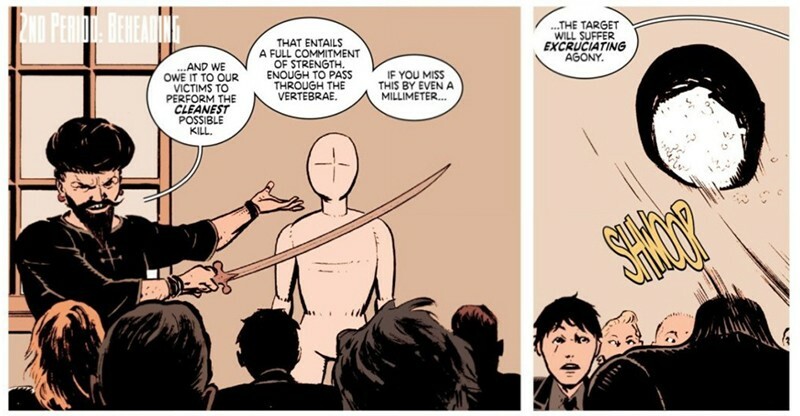 “You are soft-boiled noodles, ready for my belly,” Master Zane taunts before asking for a student volunteer to spar with in Deadly Class #2. Marcus hesitantly agrees on his first day of class before Zane puts him in a hammerlock, tripping him into a face plant. “When faced with impossible odds, it is better to lose face and decline than to attempt that which is beyond you," Zane admonishes afterwards. 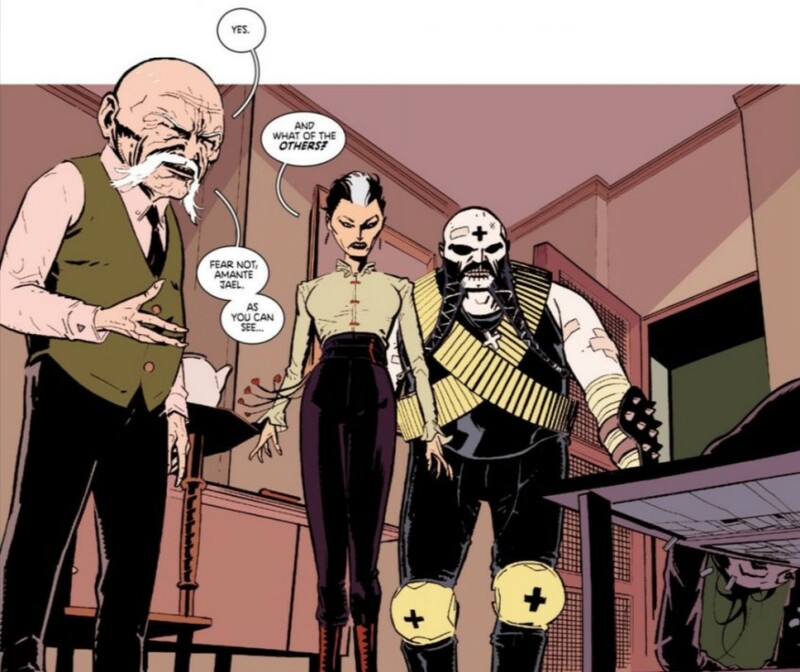 Zane later pits a machine gun-toting Viktor against Maria in Deadly Class issue #9; Maria lies in wait in a locker before surprising the Russian strongman. She incapacitates him by blowing blinding powder in his face before kneeing him in the crotch and readying a throat slice with her bladed fan. Zane praises the execution as "a perfect example of misdirection... Maria has clearly been trained since a young age to sneak and strike with the instinct of a born killer." 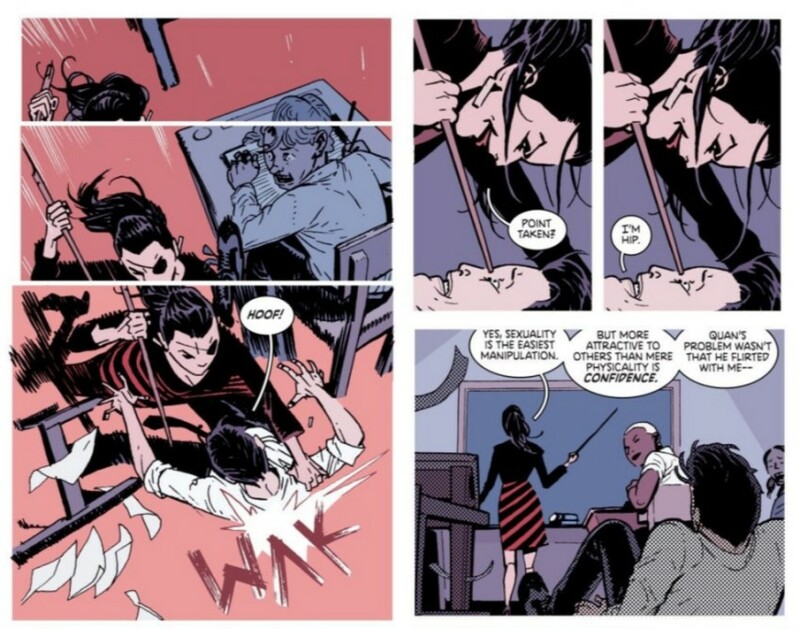 Though accidental, Marcus would receive revenge for his humiliation against Zane in Deadly Class #16, right before Master Lin announces the rat-hunting final exam. Masked and armed, Marcus hunts down Viktor with intent to kill after Viktor threatens to expose Marcus and Maria's murder of Maria's ex-boyfriend, Chico. As Marcus hunts Viktor, firing blindly, Zane bursts through the door in response to the commotion as one of Marcus' bullets collides with the side of Zane's face. Master Omenuko teaches the art of ritualistic execution, promising his class that it "will be put through the most terrible trials of your life." And his assignments absolutely live up to that devastating vow. On Marcus' first day, Omenuko tasks him and Willie to murder a vagrant who has committed evil in their life. Failure to execute is more than a bad grade, though. If the students are caught by authorities in their first school-assigned homicide, Omenuko advises them to kill themselves, or "one of your classmates will be sent to do so." Marcus and Willie manage to kill a target—a homeless Vietnam veteran who Marcus knew from his time on the streets. Master Lin and Omenuko chastise Marcus, who performed the killing blow, for ending the life of a "decorated war hero who landed on the streets purely through misfortune and substance abuse." As punishment, Lin and Omenuko throw Marcus into solitary confinement for a week to relive his slaying of the innocent man. 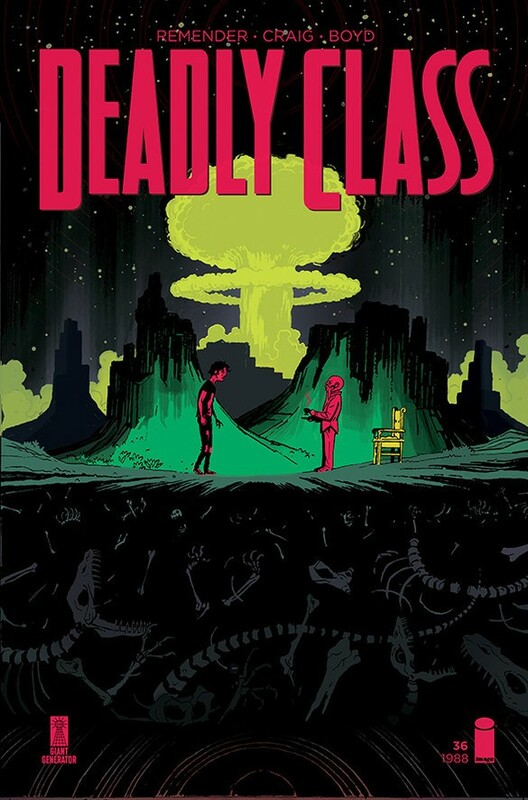 Deadly Class #37 debuts in comic book stores on February 27th, 2019.